One of the challenging things about car travel in France is the high distraction factor. It’s very easy to get side tracked by really cool sites. Case in point: Diane and I took a few days off while my parents were taking care of the kids (Merci Maman et Papa!) and we decided to go to Avignon. After driving for less than half an hour from home, we saw a really cool medieval fortress perched up on a cliff by the highway. As an engineering geek, now I can’t help notice such building subtleties at other medieval sites. Neat! We also learned to speak the language of medieval soldiers and in particular how they described their coat of arms. 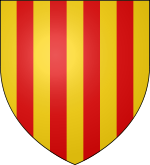 For example, the original Provence Coat of Arms is said to be “D’or aux quatre pals de gueules” (Of gold with four pallets of mouths). Note: Yellow is said as “gold” and red is said as “mouths”. We ended up staying in Mornas for the night, about 25 minutes away from home. The next day, our determination to get to Avignon evaporated after driving for about 10 minutes as we got distracted by Orange and its famous Roman Arc de Triomphe, its world heritage Roman Amphitheater, and so on. 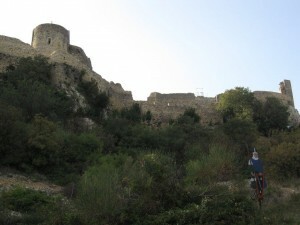 We stumbled on so many cool things on our way that we never made it to Avignon. Drive with your eyes closed. Select a destination (at home, away from distractions), then drive straight there without taking your eyes off the road. This way, you won’t get off track with really cool distractions. Planning is for losers. Just hop in the car, drive, and be surprised. Chances are, you won’t go very far, but you’ll enjoy every minute of it. Focus on day trips. You’ll end up staying less than half an hour from home, so why pay for a hotel room? Unless your objective is to prop up the French economy. Did you get to see the indise of the roman amphitheatre? We only got to see it from the outside, but that was beautifully preserved. Planning is for losers. Yes. Jeff always laughs at me, because whenever we go somewhere, I’m constantly wanting to turn off on the side roads … “just to see what’s down there”. For what it’s worth, we thought Orange was WAY cooler than Avignon, so I don’t think you missed out on anything. And a kid free evening/morning is not to be sneered at, even if you are only 25 minutes from home!